The Tactical Shotgun Course is designed to introduce the shooter from basic to advanced skills all. Shooters will start with the skills needed to safely deploy a Shotgun. We will move through this class in a simple to complex manner. Topics start with basic shooting fundamentals such as grip, stance and trigger control. Students are individually evaluated to demonstrate their ability of accuracy, and consistency. Within a short time, the student will be introduced to the application of shotgun in all its forms. 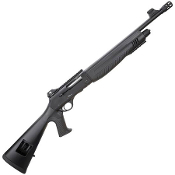 We will discuss the distinct advantages and disadvantages of the shotgun. Some topics to be covered are: loading (combat and tactical) single shots from the on guard position, multiple shots, multiple targets, and skip shooting. We will also cover the use of specific use ammo from bird shot to slugs and buckshot. Timers will be used to challenge shooters during this class. This is a fast paced class with a lot of shooting. Any semi-auto shotgun or pump action will suffice for this class. Limited space for camping is available. Save by purchasing as an add on to this match. This amount covers camping for Friday night only. The facility closes after the class ends on Saturday. Campers can arrive between 5pm and 9pm on Friday night. The gates will be locked before and after these times.